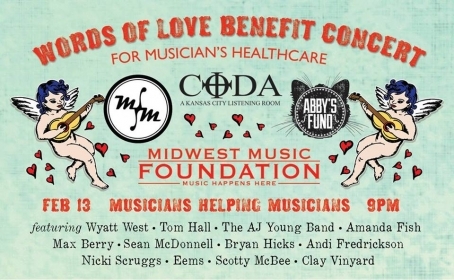 On Saturday, a collection of Kansas City acts will take the stage at Coda for the first Words of Love benefit concert for Midwest Music Foundation. The show was organized by Joelle St. Pierre, who volunteers for the nonprofit music organization. Read our Q&A with her and find out more about the show. The Deli: Give us a brief overview of what Words of Love is all about. Joelle St. Pierre: Words of Love is a collection of artists that include Wyatt West with Tom Hall, Bryan Hicks, AJ Young, Amanda Fish, Nicki Scruggs, Eems, Sean McDonnell, Thomas Freight Train Walker, Max Berry, and more for a musical tribute to the many faces of love. The musicians will play in different groupings as a full band and as duets, smaller ensembles, etc. The Deli: How did this show come about? St. Pierre: The concept began almost a year ago when Matthew Stevens donated to the KKFI band auction for Wyatt West to play an event and had always wanted this to be a benefit for MMF. Matthew has received funds from MMF to cover rent for a local musician who was injured. I began as coordinator and contacted Wyatt, who put together the musicians, theme, date, venue, and logo. Wyatt is a top-notch singer songwriter with 2 new CDs out in 2015 and is associated with the musicians that have volunteered their time for our fundraiser. The Deli: How did you get involved with MMF and volunteering in the music community? St. Pierre: I began 3 years ago after a dear friend turned me on to Diana Ennis's KKFI Tasty Brew show and have volunteered for all fundraisers at the studio and many in our local area. My MMF volunteering began with Crossroads Music Fest and I can't get enough! The Deli: What kind of influence do you think MMF has on musicians and the local music community? St. Pierre: MMF brings together a collection of local musicians to support one another, which is vital for the continued success of musicians as well as local venues and MidCoast Takeover. This particular fundraiser began with a music fan who wanted to recognize MMF for their efforts to help him and the musician. The impact of MMF is widely felt, as it takes very little to become homeless and destitute when injured or ill. MMF creates a feeling of relief, a shelter from the storm and perhaps, even greater, a recognition of the importance of live and recorded music and the venues in which the music is made. The Words of Love show begins at 9:00 pm with a suggested donation of $10. Facebook event page. If you’d like to get involved with Midwest Music Foundation, visit midwestmusicfound.org.